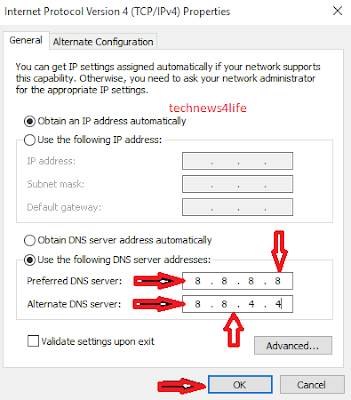 How To Fix The "DNS_PROBE_FINISHED_ BAD _CONFID"
Don't worry this is a internet Connection Error in your system and it is displayed in Browser. The Bad_Config Error is got popularity in recent times .But Today we will show how to fix the "DNS_PROBE_FINISHED_ BAD _CONFID" In 3 Ways"
In this medhod you are realeasing the ip address and renewing ip address, if the problem is in your ip address this method solve your problem. Note: you can use any of the command ipconfig/flushdns or"netsh winsock reset catalog"
Step 3: you will presents all network connections with new window now you Right click on active Connection and go to properties. Step 4: Now you can find Internet Protocol Version(TCP/Ipv4) .Now double click on it and go to properties.